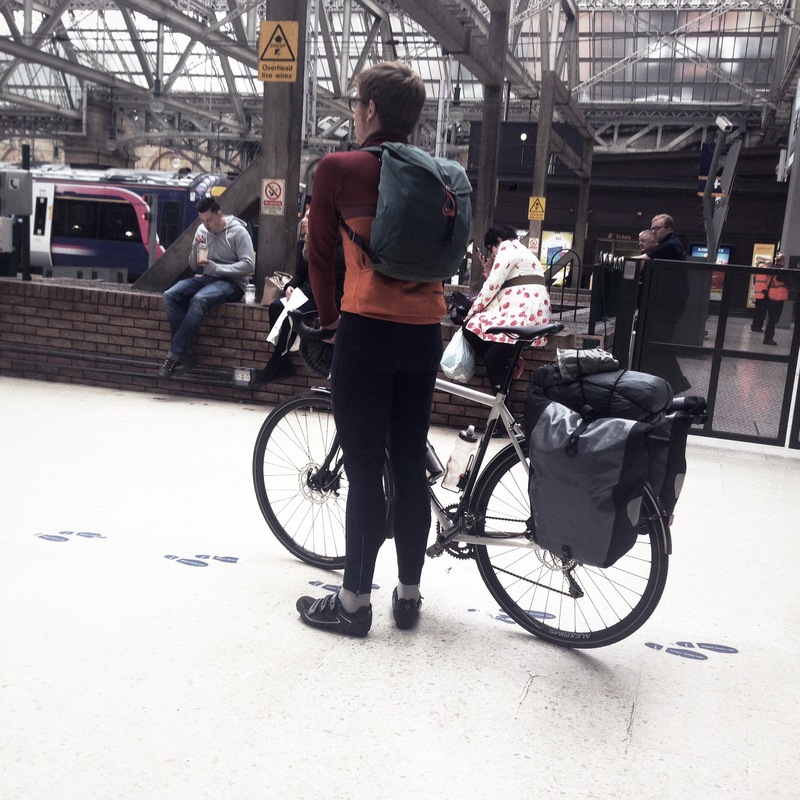 Waiting for the London train to get in at Glasgow where his friend was joining him to get another train into the highlands for 3 long days in the saddle. 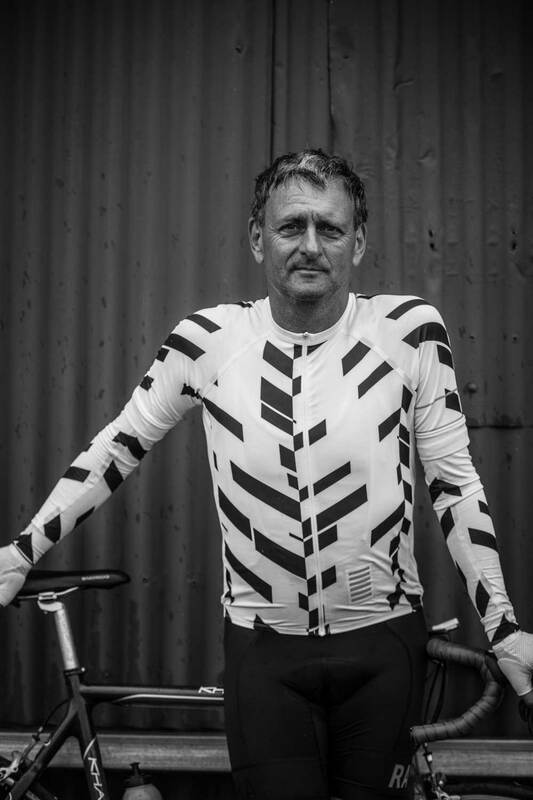 Well you know Rapha – that expensive cycle clothing brand – that is the middle class lycra lout smudge mark on cycling …. well I have a confession. I have a few items – the team jacket is incredibly warm and i have a brevet long sleeve and vest modeled here by someone prettier than me. I also have their 3/4 bib which serves me through the scottish winter. and ahem also a cyclocross short sleeve …. Lastly I would say it is top quality gear that is super comfy, well made and is yet to show any sign of wear …..
WHOEVER YOU ARE. WHEREVER YOU RIDE. WHATEVER THE REASON. Rapha Core offers the essentials in performance and functionality. Consisting of a cycling jersey and shorts for men and women, the collection is nothing more and nothing less than the basics, perfectly crafted to set the new standard in everyday ride wear. It’s the end of the year, a time for taking stock and making new resolutions. A time, however, when such good intentions are all too easily swept down the back of the sofa with the crumbs of overindulgence. Rapha’s Festive 500 challenge offers an opportunity to avoid a holiday of bloated lethargy by getting out for some on-bike contemplation.The Grand Prize for this year’s Festive 500 is being supplied by a man who knows all about leaving home comforts behind for some time alone, Tom Donhou. The master craftsman behind Donhou Bicycles, Tom is kindly offering his latest Signature Steel bike, the DSS2 (pictured in action here), for whoever puts forward the best submission in ‘the spirit of the Festive 500’ category. The prize is apt because it was while challenging himself on a bicycle that Tom came to a realisation that would change the course of his life. Tom’s eureka moment is proof that often it takes some time out to realise what has always been in front of you. His love of bikes, skill in product design, background in metalwork and old cars and ability to spend time alone without going mad are the perfect combination of elements for the profession of frame builder – he just hadn’t put it all together. And so, in 2009, Donhou Bicycles was born. Now at the forefront of a young generation of builders bringing this great tradition back up to date, this eloquent man from Norwich in England is brave and forward-thinking, often eschewing the expected for the surprising, and adventurous too, as shown by his Experiments in Speed project from 2013, when he built a bike with a staggering 104-tooth chainring and rode it as fast as he could behind his old Ford Zephyr on a runway. Tom came home happy that his own ‘horse’ had survived everything that the Icelandic elements could muster, and he immediately began production on the DSS2. Just three months later and the buzz around the bike is palpable – unsurprising given its beautiful build and the current off-road adventure riding mania taking hold. Indeed, Tom says that off-road modifications had become such a staple of his custom bike builds that commercialising his own gravel road bike was purely logical. Made of Reynolds’ flagship 853 steel tubing, and equipped with disc brakes, space for up to 35c tyres, and the Wound Up Gravel fork for when you hit the rough stuff, the lucky winner of the Festive 500 is in for a new year’s treat. The question remains, is the DSS2 that ‘perfect’ expedition bike Tom was imagining as he crossed the Gobi Desert? “No, and it wasn’t intended to be – the DSS2 has its own purpose,” he says. “The funny thing is I’ve never built that bike I imagined and maybe never will. Donhou Bicycles is the same journey for me as when I set off from Mongolia, so I’m not sure I want to do it. I might feel like I’m finished with the journey.” Not yet Tom, not yet. In fact, we think you’re just getting started. For more information on riding the Festive 500, and on how to enter to win the Donhou Signature Steel DSS2, please visit here. So Rapha have invited me to join their club …. they must have seen my purchases this last year and thought loyal fan. Membership £135 – for that there would have to be a clubhouse with lap dancing (maybe), free organic coffee that has been through the digestive tract of a civet, Chris King Salt and Pepper shakers on every table. Also the ride would involve the pairing up of members like an intellectual tinder for the brain to ensure great chat on the ride. Ideally the weather would be dialled in too – a bit of wild stuff to feel rugged and elemental but ideally 22 degrees C, perfect tarmac ….. this list could go on and on.